Adorning the waterfront of the St. Lawrence River in Old Port and Old Montreal in Quebec, Canada is the clock tower whose construction began on October 31st, 1919. The tower reaches 45 meters in height and has been referred to as "The Sailors' Memorial Clock" as it was dedicated to the sailors who died in the First World War. 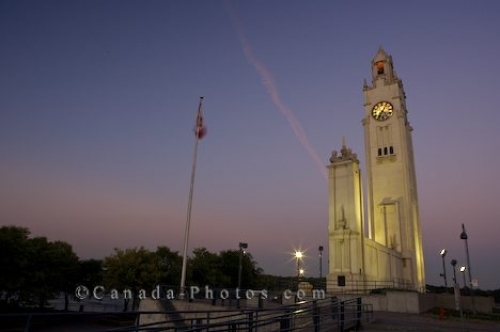 Picture of the clock tower in Old Port in Montreal, Quebec in Canada becoming illuminated as the sunset hours pass by. Old Port is a popular area for visitors to Montreal, Quebec in Canada as the venue including arts and entertainment provides ongoing activities. Old Montreal and Old Port Clock tower at sunset, Montreal, Quebec, Canada.